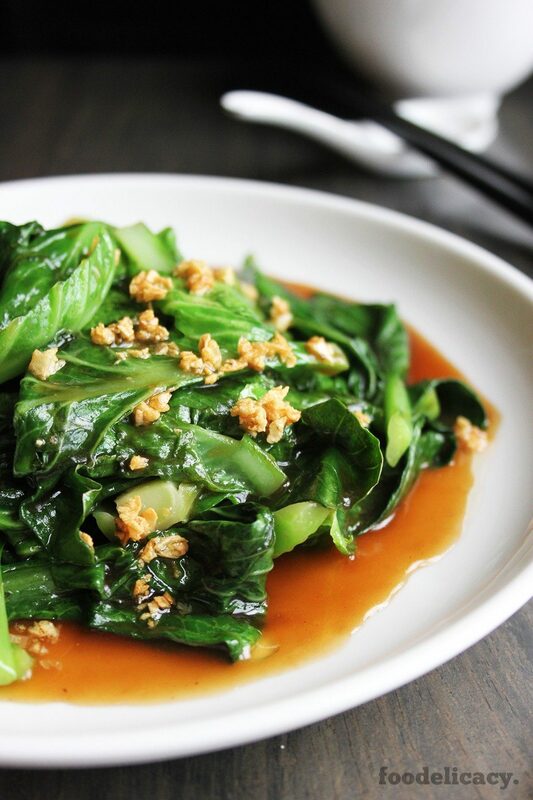 A quick and easy stir-fry recipe for kailan (Chinese broccoli or Chinese kale) in garlic-infused oyster sauce. 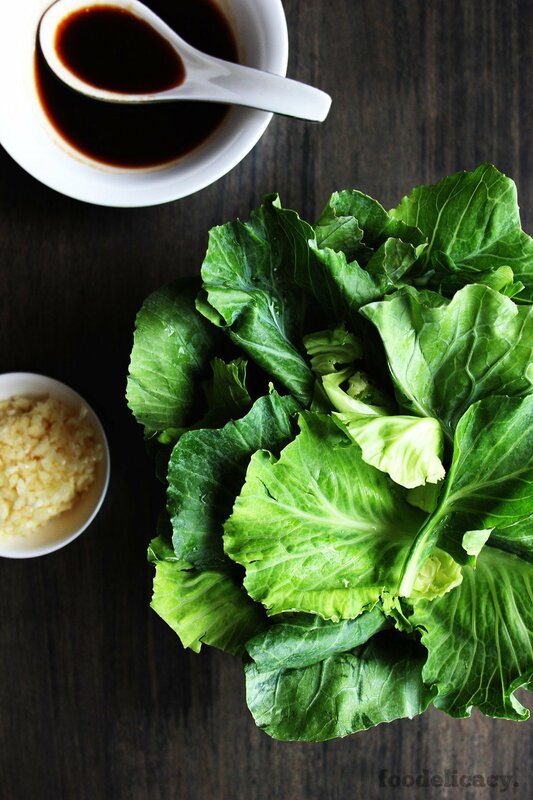 Easily adapted for your favourite Chinese greens. I’ve pinned down a really good stir-fry sauce to accompany my favourite Chinese greens. It’s taken quite a bit of tweaking, and at this point, I’d like to think of it as a really good sauce base that’s versatile enough for you to easily make it your own. This is one of those sauces where a little bit of this and a little bit of that, all come together to make an exceptionally robust, full-bodied and flavourful garlic-infused oyster sauce. This sauce can be thickened (or not at all) to your desired consistency – I know, some of us like our sauces and gravies thick, gooey and starchy to the hilt, while others prefer their veggies in a slurpy, soupy sauce. This sauce is more the consistency of a smooth glace, just thick enough to thinly coat your vegetables, and to spoon over rice. I particularly enjoy pairing this sauce with one of my favourite Chinese greens, Thai kailan or gai-lan (also sometimes referred to as Chinese broccoli or Chinese kale), but it’s just as good with other varieties of kailan including Hong Kong kailan, baby kailan, as well as other Chinese greens including cai xin, nai bai (also known as milk cabbage), bok choy, xiao bai cai (Chinese cabbage), as well as mixed vegetables. Want to make your stir-fries all the more delish? My method is to use cooking oils that are infused with the flavours of garlic or shallots. Traditionally, lard was used to flavour most stir-fries. But while I enjoy lard, it’s not something I want to use frequently in my cooking. So, here’s my next best option. I fry chopped garlic or very thinly sliced shallots in mildly hot oil until they turn golden brown and crisp up nicely when sieved out of the flavour-infused oil. It’s really easy and adds no more than 2 to 3 minutes to your preparation time, but so worth it! And to boot, you get crispy, crunchy, garlicky morsels as you tuck into your veggies, as well as attractive specks of golden brown to warm up the colour of your dish. You might like to check out some useful tips on how to execute a good stir-fry in my post on stir-fried nai bai with garlic. Do read this post as well if you’re looking for a lightly-flavoured or clear-coloured sauce to accompany your vegetables. Slice off the tough ends, and cut kailan in halves, lengthwise. Wash thoroughly in a few changes of water to remove soil particles and grit. 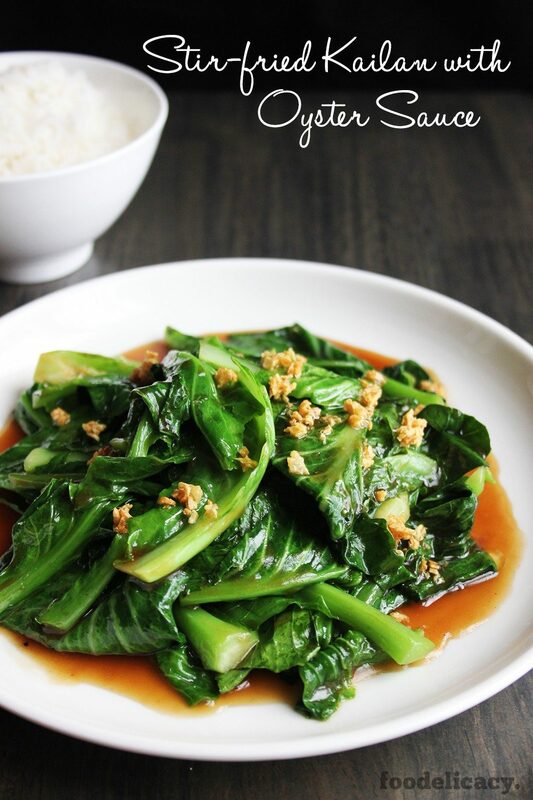 (If using other varieties of kailan, please read Recipe Notes below). Drain off excess water and set aside. In a small bowl, combine sauce ingredients and stir to mix well. Do a taste test, and tweak ingredient amounts to suit your tastes. In a separate bowl, combine corn flour and water. Heat up a wok over medium heat. When wok is hot, reduce to low heat, add cooking oil. Tip in the minced garlic and stir continuously until garlic just starts to turn a light, golden brown. Turn off the heat and remove garlic immediately with a slotted spoon (note: garlic burns quickly once it turns golden brown, and will taste bitter). Leave the garlic-infused oil in the wok. Heat up the wok (with garlic-infused oil) over high heat. When hot again, tip in the vegetables all at once and stir fry vigorously for 1 minute, or until stems and leaves just start to soften and turn limp. Add the sauce, and thicken with corn starch solution to desired consistency (remember to stir the cornstarch solution vigorously before adding in). Dish out onto serving plate, garnish with fried garlic bits, and serve immediately. #1. 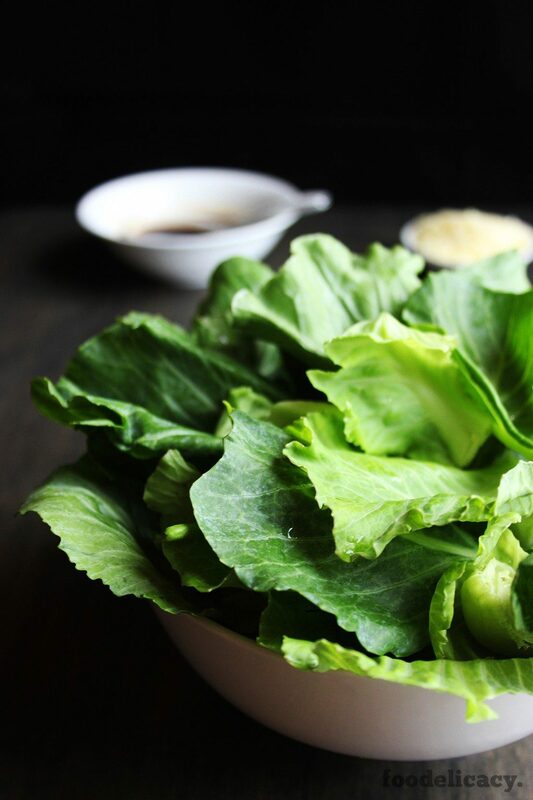 Depending on the variety of kailan you are cooking, you may need to discard or peel the outer, tougher fibrous layer off the kailan stems using a short-bladed kitchen knife. This will also allow the kailan stems to cook through quickly, and minimise the risk of overcooking. #2. If you are cooking a long-stemmed variety where the stems are to be cooked as well, it is a good practice to separate the leaves from the stems, and when ready to stir fry, to fry the stems first until slightly softened, followed by the leaves. Alternatively, after peeling the outer, tough fibrous layer, you may slice the stems thinly if stems are quite thick. This way, the stems amd leaves can be tipped into the hot oil at the same time. #3. You can combine sauce ingredients and corn starch solution together in a bowl, however, it will be harder to control the consistency of the sauce. With experience, you can eyeball how much thickening solution is needed for the amount of sauce you prepare. Previous Post: « Pound Cake – An Indulgence You’ll More Than Love. Hello Ayah! So glad you found my blog! Welcome!? My first visit, attracted by stir fry kailan in garlic sauce recipe. Very interesting and will visit as frequently s I can for recipes. Hi Celia, so other than the braised chicken in oyster sauce I also cooked this kailan recipe. It was yummy! I omitted the oyster sauce in this recipe because the chicken already has oyster sauce. The sauce turned out great without the oyster sauce too! I didn’t have to thicken the sauce with corn starch because I thought it will also be quite nice with a light sauce. Very happy with this recipe for vegetables. Thank you very much! Hi Chris, thank you, and yes, you’re welcome to! Am glad that I can share food that I grew up on, with others. Please do share if you like what you try! Cheers! try them) recipes. I have never gone int the kitchen as my wife has looked after that department. However, now she is not as well as she used to be. So, I am attempting to fill in the gap. Thank you so much. Would appreciate if i could print your recipes.